Story time and Crafts for toddlers and preschoolers- Every Wednesday at 11:30am at the Sebring Public Library. Tyke Tales Story time is a great way to keep your little one's creative mind active during the summer. 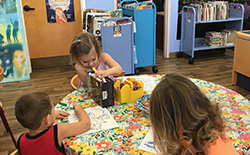 During tot time they get to participate and enjoy the excitement of reading through group Story time and crafts.